January Project Life Blog Hop - Oh boy, oh boy! I'm making a few changes to the way I use Project Life a bit this year. First off, I'm going DIGITAL! I have many reasons... But I design most of my pages digitally first anyway and I'm really trying to SIMPLIFY (that's my One Little Word for 2015). I plan to print the pages as 12x12 photos and ise the Becky Higgins 12x12 page protectors. I just can't waint til the end of the year to be flipping through my PL album... I may or may not have insert pages, we'll just see how it goes. I'm still unsure if I'll be keeping my spreads as a weekly overview or if I'm just going to "scrap what I feel like". I'm not going to give myself too many rules. Remember, SIMPLIFY. So, that brings me to another thing... I seriously had a hard time picking a kit this year. In order to keep things simple, in the past I've pretty much kept it to one Core kit per year (with some random inserts and pages with other specalty themes). But I just plain can't decide in a Core kit for the year! This is the Kiwi Edition (which I totally LOVE, but have already used in the past...). Then, Becky recently announced a few new Core kits!!! And I haven't seen any more than you all have, but I think I might switch over to the High Five kit when it becomes available!!! How great does that kit look?!?!! And seriously, Lili Niclass' designs are my FAV! Love her! I think it looks great for us, as a mom of just boys, I find most of the kits way to girly and the High Five kit looks a little more neutral from the pieced shared so far. I'm excited to be SIMPLIFYing a bit more, maybe I can keep up better. I'm not sure how much I'll miss cuttung and trimming and putting photos in pockets and the physical "hand-on" part of the traditional approach, so again, we'll just see how this goes! What different approaches are YOU using this year with your PL? What kits are YOUR fav? I'd love to hear from you guys!!! Please note that these are fun and optional blog hops. If you don't see your favourite former team member, please visit their individual blogs to see what they are up too! We hope you enjoyed this hop! 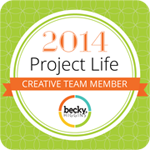 Project Life is a memory keeping system from Becky Higgins. You can find out more about her system and product here.